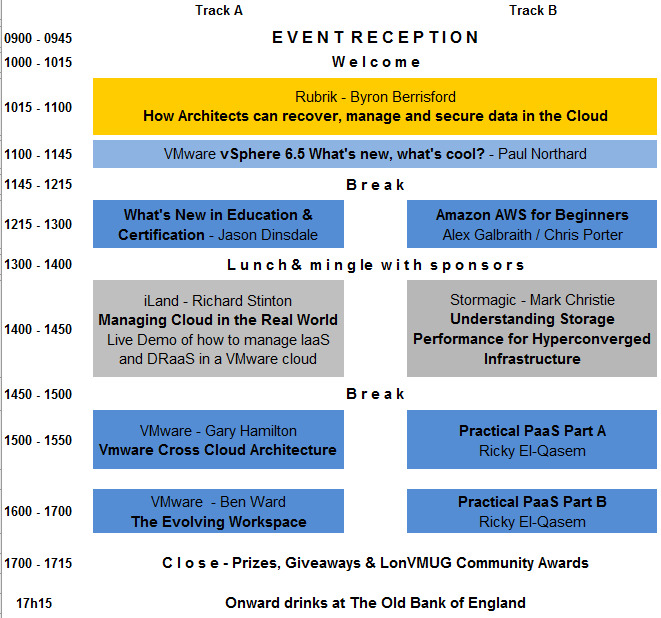 Join us for the upcoming UK-London VMUG meeting on 19 January 2017. This is a great opportunity to meet with your peers to discuss the latest trends, best practices, and the technology! Please also join the UK-London Community to connect with other members and stay informed for upcoming meetings. The blazing pace of innovation in the enterprise datacentre has impacted how applications are delivered by the enterprise. As businesses continue to build more complex services across a global footprint, the ability to protect, manage, and secure data with traditional solutions are simply unequipped to move into the cloud world. What’s needed is a new approach to providing data protection. One that natively talks RESTful APIs and is weaved together using a fabric of smart, distributed services and is built by engineers who have lead web-scale design before the term was even coined. In this session, join Byron Berrisford, Systems Engineer at Rubrik, as he talks about the challenges facing the modern architect embarking on a journey to the enterprise cloud. Learn how it’s possible to sweep the floor of complex and piecemeal data protection solutions by using a scale-out software fabric across on-premises and cloud environments. See Rubrik’s Cloud Data Management stack in action as smart policies, not jobs, are applied to a hierarchy workloads and applications to recover, manage, and secure your data. Everywhere. In this presentation, Richard Stinton, Solutions Architect at iland, will provide an overview of how customers are using cloud services today, namely IaaS, DRaaS and Cloud Backup, and will then provide a demonstration of how easy it is to manage these cloud services with the iland cloud console which integrates VMware vCloud Director with Zerto DRaaS, Trend Micro Deep Security, Veeam Backup as well as deep integration with vSphere for performance reporting. Using real-world data to show how to configure your hyperconverged infrastructure for cost, efficiency and performance Hyperconverged infrastructure is now being broadly adopted, yet many organisations are blindly deploying these new shiny toys without clear line of sight to an optimal storage configuration. StorMagic will present real-world data from a large variety of customers removing the fog of how best to configure for the perfect balance of cost, efficiency and performance.